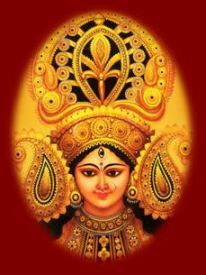 Durga Chalisa - Chalisa lyrics and download- Jai Maa Chintpurni Ji! Jai Maa Chhinnmastika Ji! I Salute You, O Mother Durga, You Bestow Happiness to all. I Salute You, O Mother Ambe, You End all Miseries. Your Radiance is Limitless. You illuminate all the Three Worlds. Your Forehead shines like the Moon and your Face is Very Big. And Your Eyes are Red with Broad Eyebrows. Your Look is Enchanting, The very Sight of Which gives Joy to All. In You lie all the Powers of the World. And You Nurture the World with Food and Wealth. You as Mother Annapoorna Nurture the whole World. And You are the Primordial Sundari Bala (form of a young girl of extreme beauty). You Destroy Everything at the time of Pralaya (the great Dissolution). You are Mother Gouri, the Beloved Consort of Lord Shankara (Shiva). Your Praises are Sung by Lord Shiva and the Yogis. And on You Brahma and Vishnu always Meditate. You Assume the Form of Mother Saraswati, And Grant Wisdom to the Sages and thus ensure their Welfare. You Assumed the Form of Lord Narasimha, And Appeared Breaking the Pillar (to save Prahlada). You Assumed the Form of Mother Lakshmi, And Repose by the Side of Shree Narayana. You Dwell in the Ocean of Milk (with Lord Vishnu), And You are the Ocean of Compassion; Please Fulfill my Wishes. You are Mother Bhavani in Hingalaja, Your Glories are Limitless and cannot be Described. You are Matangi and Dhoomavati Mata. And You as Mother Bhuvaneshwari and Mother Bagalamukhi Bestow Happiness to all. You are Mother Bhairavi and Tara Devi, the Redeemer of the World. And You as Mother Chhinnamasta, Remove the Sorrows of the World. You Reposing Gracefully upon the Lion as Mother Bhavani, is welcome by the Brave Hanuman Moving Forward. You Appear with Skull and Sword in Hands, Seeing Which even Time Flees in Panic. Seeing You, Well-Armed and with Trident in Hand, The Heart of the Enemies Tremble with Fear. You Repose in Nagarkot (Kangra). And make the Three Worlds Shudder with the Might of Your Glory. You Killed the Demons Shumbha and Nishumbha, And also the Many Rakta Bija Demons. Mahishasura the King was very Proud, And Filled the Earth with the Weight of his Many Sins. You Assumed the Ferocious Form of Mother Kali, And Killed Him (Mahishasura) Along With his Army. Whenever the Saints were in Trouble, Mother, You came to their Rescue. Amarpuri and other Lokas, Remain Sorrowless because of Your Grace. Your Light resides in Jwalamukhi Devi. All Men and Women Always Worship You. Whoever Sing your Praises with Love and Devotion, Sorrow and Poverty will Not Come Near him. Those who Meditate on You Deeply, Will be Freed from the cycles of Birth and Death. Yogis, Devas and Sages say that, Without your Power there cannot be Yoga (union with the Divine). Shankar Acharya did Penance, And Won over Desire and Anger. He Always Meditated on Lord Shiva, And Never Thought of You. He Did Not Realize the Glory of Shakti, When his Powers Waned, he started Repenting. Then he sought Your Refuge and Sung Your Praises, Victory, Victory, Victory to Mother Bhavani, the Mother of the Universe. This Pleased the Adi Jagadamba (Primeval Mother of the World), And She Gave back his Powers Without Delay. I am Surrounded by Grave Distress, O Mother, Apart from You, Who can Remove my Sorrows? Desires and Longings always Torture me, And Passions and Lust Torment me. O Great Queen, please Destroy my Enemies, I Meditate on You with One-Pointed Devotion. Bestow Your Grace on me, O Kind Mother. And Give me (Spiritual) Wealth and Power. As Long as I Live, may I be a Recipient of Your Mercy, And let me Always Sing Your Glories to Others. Those who Sing the Durga Chalisa Everyday, Will get Worldly Prosperity and finally Attain the Supreme Feet of the Mother. Knowing that Devidas has taken your Refuge, Please Bestow your Grace, O Mother Jagadamba Bhavani.